Then you’ll love Bite Me Burger. Love Pop Ups London had the pleasure in going along to Bite Me Burger Co that popped up in Holborn. Bite Me Burger Co believes that size isn’t everything so this is why they created mini burgers which fit between your finger and thumb literally. Leaving you with the option to purchase a couple to a whopper load. They come in duo, trip, quad and dozen size portions. The hottest young critically acclaimed Young British Foodies Award winner chef Adam Rawson is the mastermind behind the menu. However if you can’t get to Holborn you can always get it delivered be it at your office you work, a party, a special event, wedding, etc. Thanks to Bite Me Burger who let some of us from the community of Love Pop Ups London come down to sample your burgertastic burgers. Read our blogs/reviews from the comments section below. Finally a place where I can order sliders knowing that they will be tasty and juicy! 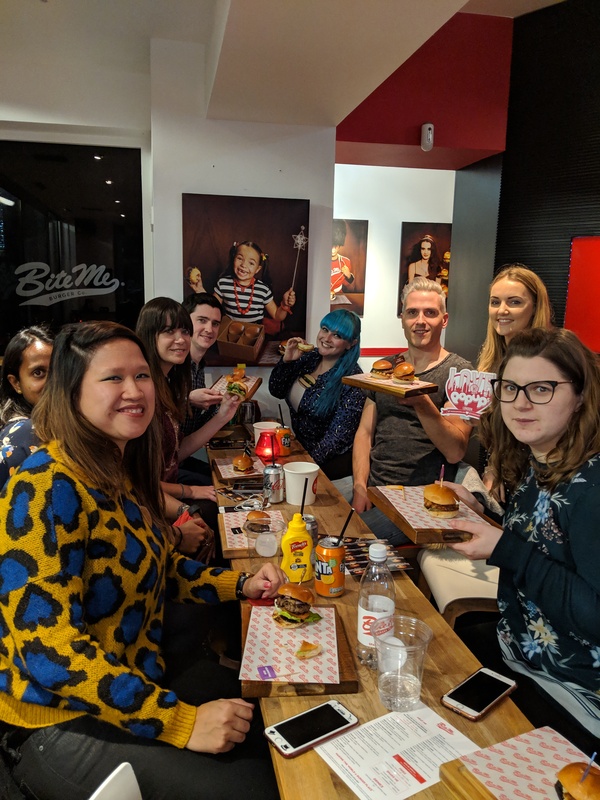 I got to visit Bite Me Burger Co along with the gang thanks to LovePopUpsLondon.com. We went to their venue inside Cha Chaan Teng (another place with amazing food), but they will soon have locations in Soho such as Freedom Bar. as well as elsewhere. Have you wondered how many bite-sized burgers you might be able to chow down? They are so sought after that these miniature sized burgers have earned the right to their own name, sliders. It’s eventually, and quite rightly, a mini burger. I do not usually opt for a down-sized burger, but an invitation from LovePopUpsLondon tempted me along for a night of burgers and milkshake from Bite Me Burger Co.
Shakes to Fries and Coca Cola. Along with the fries that I ordered which were delicious I had the Bacon Cheese burger which consisted of Aged beef patty, cream cheese aioli, bacon, Brie, crispy onion which was great in keeping with tradition with classic ingredients you’d expect from a burger. I also had a Bloody Mary which had Aged grilled beef patty, horseradish, onion, cheddar cheese, secret Bloody Mary sauce and I have to say it had quite a kick to it with a combination of great flavours. Lastly I went for the traditional American Hot Dog, with crispy onions, tomato sauce, American mustard and this for me was the best, flavours bouncing all round my mouth and my pallet on overtime! I’m a lover of milkshakes and for me Bite Me Burger’s milkshakes were absolutely amazing! Unique Flavours on the menu from Oreo, Coconut, Peanut Butter and your classic flavours Strawberry, Vanilla and the one I had Chocolate, not too thick not too runny just the right consistency for a classic shake. plus they can cater at Weddings and many other events, contact them for more details. I’d Say if you are local to Holborn and love a burger (or 2 or 3) then head down to Kingsway or even get it delivered if you are lucky enough to be in the delivery range, I know where I’m heading again for my next burger! I love burgers and find it hard to pinpoint the burger I want to have when ordering. Luckily for me Bite Me Burger offers options of sliders holding different amounts of the 9 mini burgers they offer to try. I love foodie pop-ups and one of the newest to make its way to London is Bite Me Burger Co., which opened in Holborn last month in a temporary residency inside Hong Kong café Cha Chaan Teng and will receive more pop-ups across London – in addition to offering deliveries and catering. Bite Me Burger is the brain child of award-winning chef Adam Rawson who made a name for himself as the winner of the Slider Decider competition two consecutive years and, unsurprisingly, sliders are front and centre on the menu. Thanks to LovePopUpsLondon.com @lovepopupslondon I was lucky enough to get invited to this great burger pop up kitchen housed in the trendy Cha Chaan Teng on Kingsway. Bite Me Burger Co is just a short walk from Holborn Tube Station. They are also branching out after their recent pop up success at Pride, with two new outlets in Soho at the Freedom and ‘O’ bars on Wardour Street. It’s such a great concept, especially for those people who find downing a large burger a bit daunting. Basically the burgers are slightly larger than a burger slider. The idea is that rather than stick with the one burger, you can chose smaller ones to mix and match and make your burger meal more interesting for the taste buds. They come in either duo, trio and quad portions. Popular with the local office takeaway and deliveries are the Dozen burger portion (A large order was being shipped to the ITV Studios when we were there). I had the Trio option. The 3 choices I went for was The BC (Bacon and Cheese), The Bloody Mary and American Hot Dog for my third choice. This was complemented my a portion of fries and a Peanut Butter milkshake. Of the two burgers I had the Bloody Mary was favourite. It must have been the added horseradish and secret bloody mary sauce, it was delicious. THe BC was good too, just the Bloody Mary burger would have me coming back here for the taste alone. The big surprise for me was the American Hot Dog. I loved it! The crispy onion topping was soooo good. It was my first time having a Peanut Butter milkshake, and it did not disappoint. I thought it would be a bit heavy and difficult to finish it, but it was not heavy at all. It is a milkshake I’d go for again. I can see Bite Me Burger taking off really well. I’m sure it will not be long before there are numerous outlets across London. Also looking forward to when their delivery service reaches my neighbourhood in W9!! This time I went for the Jack Daniel’s and the Beef Encounter. Nothing at fault taste wise (vs when I went thought the Lambtastic was missing a bit of a kick but apparently they fixed it according to people who ve tried it that night). It’s just the perfect bite and size. You can have so many flavour instead of having to choose the sole normal size burger. Love the concept, love the food. They might need to do something about the ambiance but not quite sure what but it feels like something is missing. If like me, you like burgers but find them too filling at time, Bite Me Burger may be for you. The concept is simple – mini burgers in a variety of flavours. However, even though the size may be small, you flavour is not at all diminished. I tried the Lambtastic, which was succulent and had a great kick at the end. The Jack Daniels was also lovely and the beef patty was beautifully cooked. I thought the fries were fab – they were crispy and well-seasoned. The sweet potato fries were cooked slightly differently and were soft rather than crispy – I like this, but it may not be everyone. The staff were friendly and genuinely wanted our feedback so that they could make any necessary improvements. A great little find. There are also some fab deals on making this place an inexpensive choice. Love love love this concept! I often can’t try all the burgers I fancy on a menu, but with these bitesized one I can! Not having to decide on one burger is great!